Diamonds for Dessert: Potter Puppet Pals! Today's post involves a bit of catch-up. If you have been keeping up with my blog, you'll know that back in January I had my Harry Potter Party. 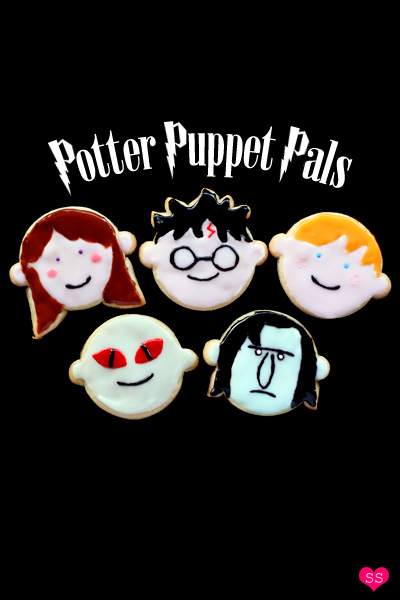 Originally, I had intended to serve these Potter Puppet Pal sugar cookies at the party, along with all the other HP-themed foods, but, I ran out of time to finish them. Instead, I ended up icing them two days later and I'm finally posting about them today. If you aren't familiar with Potter Puppet Pals, it's a live action comedy series created by Neil Cicierega. The main characters of Harry Potter appear as hand puppets (except for Neville, who shows up as a butternut squash :D). My favorite episode is "The Mysterious Ticking Noise", which according to Wikipedia is the 15th most viewed video on Youtube. I attached it to the bottom of this post for those of you who haven't seen it. By the way, there's no Fred and George in Potter Puppet Pals. I just thought it was funny that 2 Rons = Fred + George, who happen to be my favorite characters in the HP series :). 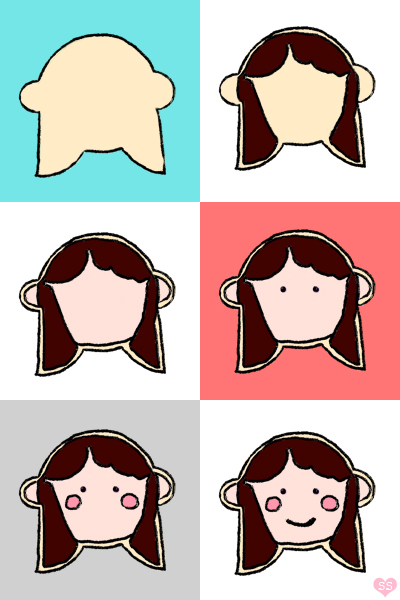 Before baking, the dough needs to shaped into the heads of all your characters. 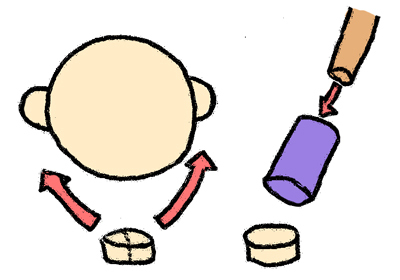 The picture above shows how to make the general head shape. Cut out 1-inch circles with your cookie cutter. Take your pearl milk tea straw and cut off a bit of the end. Use this straw end piece to make lots of tiny circles from your dough, pushing them out of the straw with a chopstick. These tiny circles can be split into two with your knife to make ears. 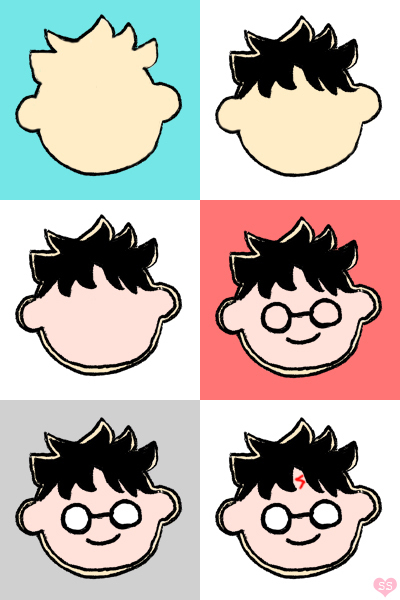 From this shape you can make Voldemort and Ron, or you can add on more (shown below) to make the heads of the remaining characters. 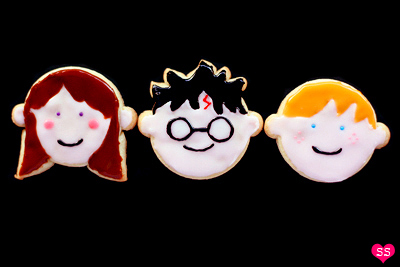 To make Hermione's head, make a 1-inch circle with your cookie cutter. Split this circle into 8 equal sections with a knife. Take two of these wedges and add them to the general head shape to make Hermione's hair. To make Snape's head. Take one of the tiny straw circles, split it in half and use those halves to form the bottom portion of Snape's hair. 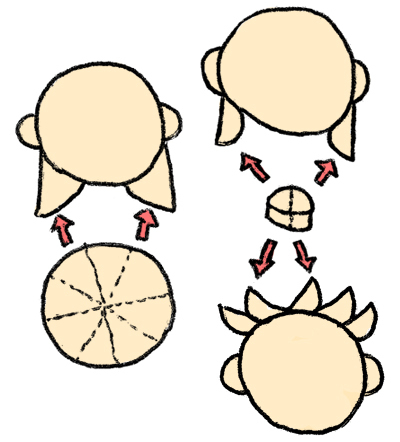 And lastly, to make Harry, take five of those tiny circle halves and add them to the top of a general head to form his spiky hair. To make Voldemort's green skin color, take a tiny bit of white icing and mix in a drop of green food coloring and a drop of yellow. Take a very small bit of that yellow green icing you just created and mix it into a larger portion of white icing, adding more if necessary to create the color you want. Now with a spoon, fill in your cookie with the light green skin icing. Next, make red icing and create the eyes. Lastly, make black icing, place it in a small sandwich bag, and squeeze out the mouth and the lines for his cat-like pupils. To make the peach skin color to be used for Ron, Hermione, and Harry, make some white icing. Take a little bit of that white icing and place it in a separate bowl. Mix in yellow, orange, and pink food coloring. Now, take a little bit of that mixture and add it to the rest of your white icing, adding more if necessary to get the skin color you desire. Cover your bowl of icing until ready to use. Now make yellow orange icing and lightly trace out his hair with a toothpick or spoon. Fill in his hair by following your outline. Wait for the icing to dry. Next, fill in the rest of the blank face with the peach icing you made before. Add on your two blue sprinkles for eyes. Wait for the skin to dry. Pipe on a black icing smile. Then make a bit of pink icing and dot on four freckles on each cheek with a toothpick. Make some brown icing. With a toothpick, lightly trace out the outline of Hermione's hair. 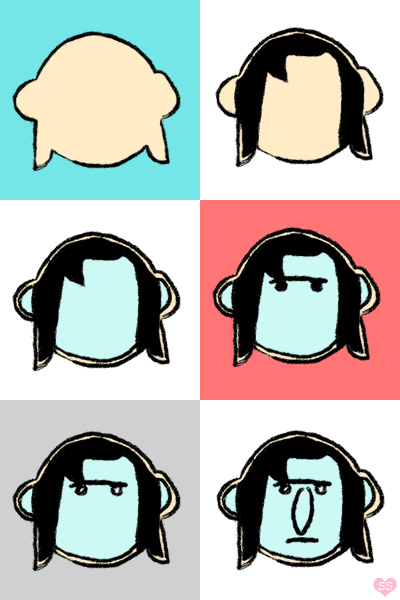 Next, with a spoon, fill in your hair outline. Then, fill in the remaining cookie with the peach icing you made above. Add on the two purple sprinkles as eyes. Wait for the peach icing to dry. 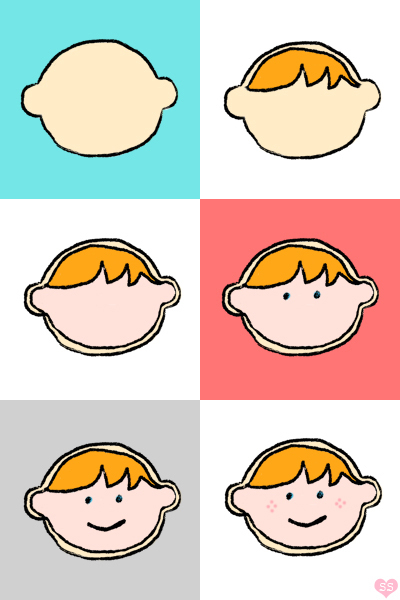 With a spoon, make a small pink circle on each cheek. Lastly, pipe on a black icing smile. Make black icing. With a toothpick, lightly trace out Harry's bangs. Then, with a spoon, fill in this outline with more black icing. Wait for it to dry. Then, use the peach icing you made above to fill in the remainder of the cookie. Wait for the peach icing to dry. Place some black icing in a sandwich bag and pipe out the glasses frame and the smile. Wait for the black icing to dry. Fill in the glasses with some white icing. Lastly, make some red icing and pipe out his lightning bolt scar. To make Snape's blue-green, "Squidward" skin color, first, make some white icing. Place a little bit of the white icing in a separate bowl and mix in green and blue food coloring. Take a little bit of the blue-green icing and mix it back into the larger portion of white icing, adding more if necessary to get the color you desire. Cover the icing until ready to use, to prevent drying out. 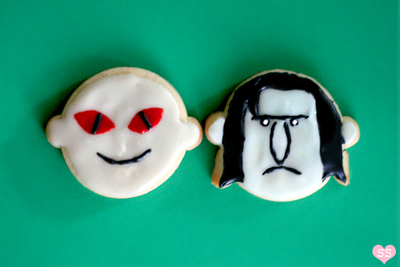 With a toothpick, lightly trace out Snape's hair with black icing. Then, fill in that outline and wait for the black icing to dry. 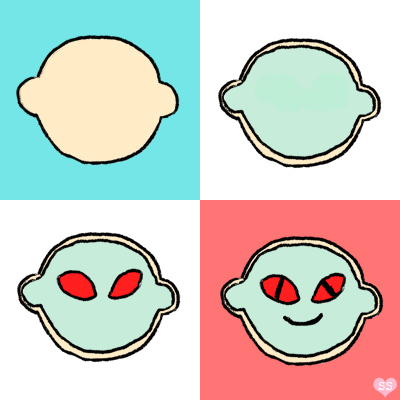 Next, use the light blue-green icing you made to fill in the remaining blank cookie. Wait for that to dry. Then, pipe out Snape's unibrow and two black circles under the unibrow as shown in the picture. Place one white sprinkle in each black icing circle for eyes. Lastly, pipe out his nose and mouth. 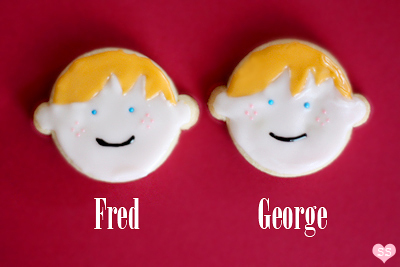 Fred & George are too cute~ This is such a creative idea! awww i am sad i missed those! and <3 potter puppet pals, i think you and stephr both love this video, cuz i feel like she's made me watch this one before. I agree, Fred and George are awesome... but, I'm also especially fond of Ron + Hermione. La Table De Nana: Thank you :)! M Cho: Thanks! Fred and George are my fav HP characters for sure. Steph: Yup, Potter Puppet Pals rock. Well, "The Mysterious Ticking Noise" is one of those very popular videos on Youtube. Actually, now that I think about it, I think we watched it at my Alice in Wonderland tea party on Didi's iphone. But all the episodes are pretty awesome, ooh, like "Wizard Angst" hehe. 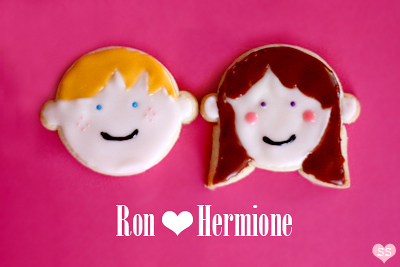 Cody: Hehe, Ron + Hermione, perfect for V-Day. I think they're quite the well suited couple. Found your blog through soompi as well and your site is uber cute! Love your recipes and layout. My friend and I were very impressed by the Harry Potter themed goods. They're extremely creative. ^_^ I've always wanted to make the creme brulee because of Amelie as well haha. Aww! These are so cute, I love them! I just clicked over from Craft Gossip. I would love to link to these if you didn't mind. yuns: Thanks for the sweet comment! I'm very glad you enjoy my blog. Yeah, every time I see that scene in Amelie, I'm always tempted to make creme brulee :P.
Rachel: Hehe, thanks! And I'm totally fine with your linking to my post :D.
Awesome cookies and thanks for introducing me to PPP. So funny! My son is gonna get a kick out of them too. oneordinaryday: No problem! I concur, PPP is hilarious. Oh my goodness! I didn't even see these when I left that other comment for you under the Easter chicks. These are AWESOME! I really love these! Great work. You are awesome! I used your directions to make chocolate molds of the characters to put on my sister's cake for her sweet 16. They turned out great and she loved it! Thanks so much! Joanna: That sounds adorable! A Harry Potter sweet sixteen birthday cake topped with little chocolate characters. Sandi: You're welcome, hehe. That sounds like a great idea: decorated sugar cookies as cake toppers! city angelz: Haha, glad you like them. miss.cupcake.fage: Definitely pre-Deathly Hallows, Fred's still there :'(. But on a happier note, I am totally looking forward to the movie! aghhhh!! anything HP makes me all warm and fuzzy inside. i love these!!! Nuha: Warm and fuzzy :). 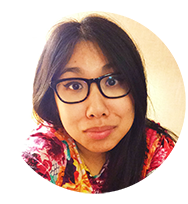 Ingrid & Nam: Thank you! This makes me laugh so hard! Snape makes me laugh! these are totally cute! and your "how to" is even cuter! you make making these look simple. i am going to try these with my kids! Michelle: Haha, I love Snape in PPP! The Urban Baker: Sounds like a fun activity to do with kids! It's a relief to see that my instructions simplify the process rather than complicate it :). Ol' Grouch: :O a non-HP fan??? Well, as long as you're coming around :P. I actually didn't find out about "A Very Potter Musical" until after I originally made this post back in Feb. But the musical itself is quite funny and I do love musicals. Oh, and the fact that Darren Criss is on Glee now makes it all the better, haha. My 10 year old son had a crappy day at school today. I showed him your cookies and it totally made his day. He didn't even have to eat one, and it made his day! Thanks from him and thanks from me! Donna: Welcome to my blog! Red Spotted Patch: Just wanted to let you know that your comment totally made my day. Thank you! Okay so I was going to just leave you an overly gushy comment, saying how absolutely amazing and adorable your creations were and how we have similar interests (definite Gleek, Harry Potter nerd, and PotC fan! ), but now this comment has to be escalated because of the above work of art: YOU ARE MY HERO. You are totally totally awesome! Keep up the great work! I can't wait to try some of these for my own, and admiring the difficult ones from afar. C: Haha, thank you so much for the sweet comment! Pop culture for the win :D! Anonymous: Thanks! HP is awesome; can't wait for the final part of the 7th movie! I ♥ Harry Potter!! I especially ♥ Ron! !